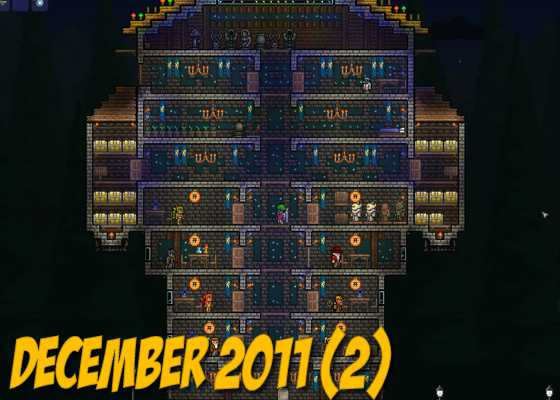 JOB Terraria Server Backups - Journey of Bokou! Each time the server map is reset we will host the old map here for you to play in single player mode to get whatever you wanted out of chests, to finish your diggy hole, or to just explore some places you didn’t get to see. Each zip file will contain a few preview pictures of the map as well as the world files. To use them: Drop them in your documents/My Games/Terraria/Worlds folder. If you have a map by the same name (ex: world2.wld) then just rename one of them to world3.wld or world4.wld etc etc. This was our first 1.1 map. Nunes unlocked hardmode pretty quickly on this map forcing the rest of us to have to start a December 2 map. Now that we’re rotating maps more frequently, this won’t be an issue. There’s both a sky highway and runway in the underworld for fighting the Wall of Flesh. There’s also plenty of mats and all the vendors in the main spawn building. This was our noob-mode map. We recently had several new players join up with us and they were getting molested by unicorns at every turn so we started a new map and they were able to survive. 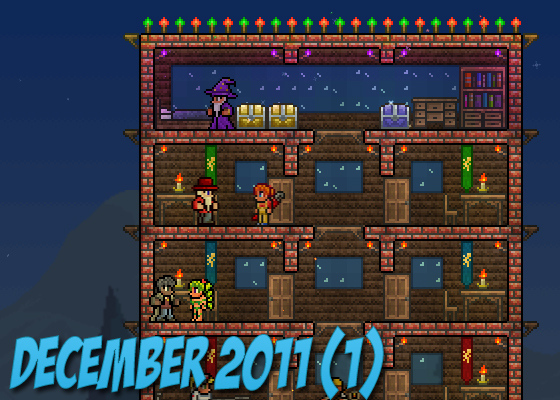 We built an elaborate starting house and had all of the normal-mode vendors. This map does not have hard mode unlocked but has loads of resources in the chests as well as an obsidian generator, some poison dart traps protecting the house, and more. This map features all NPC’s, chests of goodies, and all bosses have been defeated!